Marshall is an associate clinical speech pathologist working in the Communication Aids and Systems Clinic (CASC) and the Neuromotor Development Clinic. 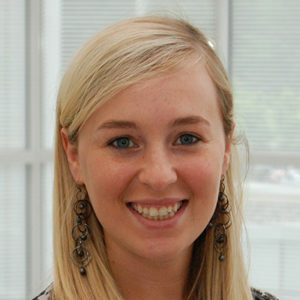 Marshall received her MA in speech-language pathology from the University of Iowa. She completed a clinical fellowship at University of Wisconsin-Madison in the Waisman Center Clinics with a particular focus on augmentative and alternative communication (AAC). Marshall is an MCH LEND graduate from both the University of Iowa and the University of Wisconsin-Madison. Her research and clinical interests include training communication partners of individuals using AAC and advancing children’s verbal speech through the use of AAC strategies. Marshall was recently selected to participate in the American Speech-Language Hearing Association (ASHA) Leadership Development Program (LDP). Through her work in that program, Marshall is currently serving as a principal investigator on a qualitative research study to identify what factors contribute most to successful outcomes for augmentative and alternative communication (AAC) users. Her research aims to guide future intervention and outreach services to allow for replication of these positive results.